Two Sarasota city commissioners raised multiple questions, and three city residents talked of plenty of public concerns. 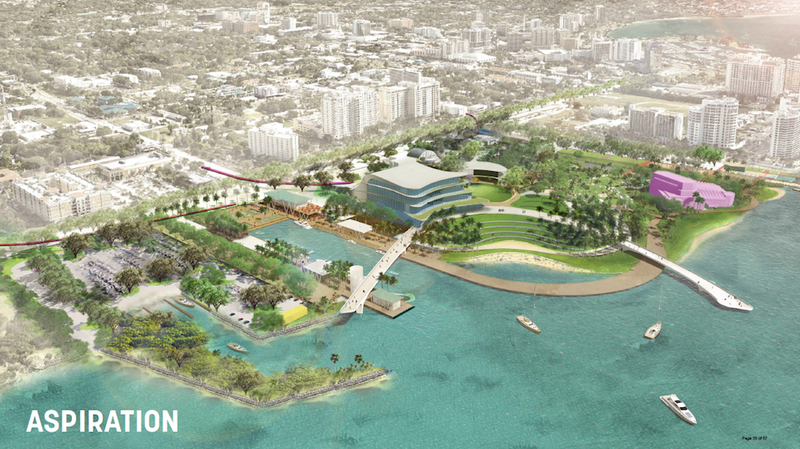 As a result, on Feb. 4, the City Commission voted unanimously to delay until March 18 the next step in a process designed to turn 53 acres of city-owned bayfront property into a destination park with cultural and arts amenities. Their goal, the board members agreed, is to vote April 1 on the formal agreement that will lay out all the necessary details for city leaders to work with a new nonprofit organization as the latter raises money for and manages The Bay, as envisioned in a master plan the commission approved in September 2018. 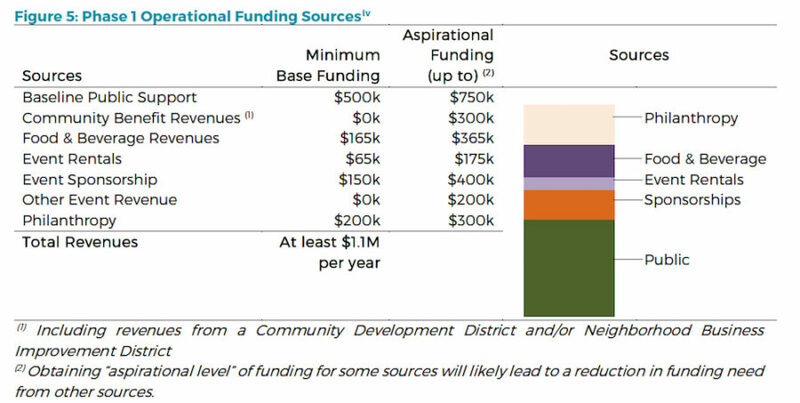 Among points two of the three members of the public raised during the commission’s Feb. 4 meeting was their surprise by the emphasis on public spending for The Bay in a proposed “term sheet” with the Bay Park Conservancy. “What’s coming into focus is that this [project] is going to be largely publicly funded,” Cathy Antunes, a Golden Gate Point resident, told the commissioners. Yet, city representatives previously had explained to her that most of the money for the park and its amenities would come from private sources, Antunes said. 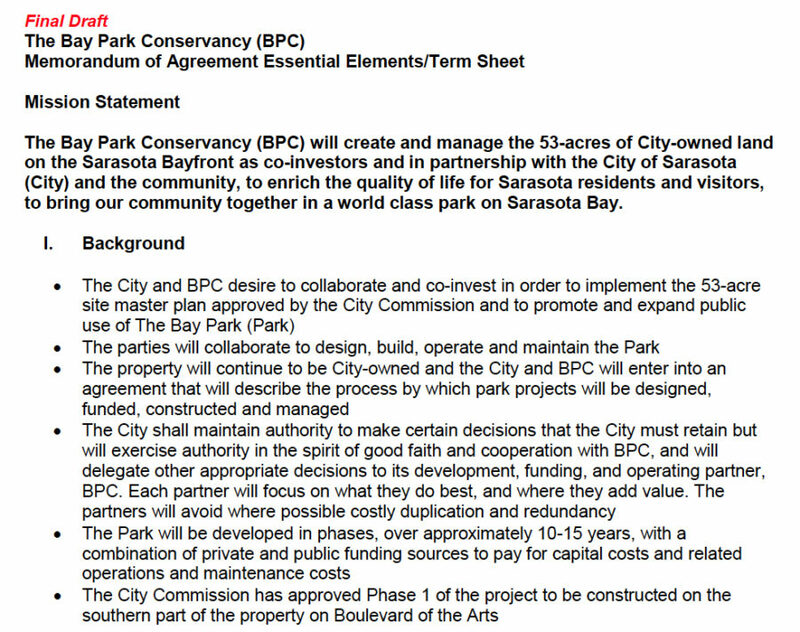 Last year, in documents provided to the city, the leaders of the Sarasota Bayfront Planning Organization (SBPO) did not include an overall estimate for the completion of The Bay. 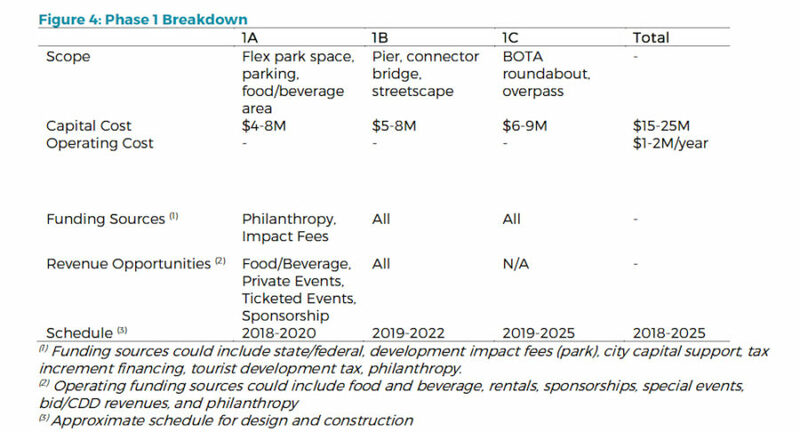 However, because the master plan includes a new performing arts complex and the repurposing of the Van Wezel Performing Arts Hall — as well as pedestrian walkovers of U.S. 41, to facilitate public access to the park — hundred-million-dollar figures have been aired. The document “gives away your decision-making power on numerous key points,” Lobeck told the commissioners, including the handling of leases, contracts and parking. Three representatives of the former SBPO, which saw its sunset at the end of 2018, appeared before the commission on Feb. 4 as leaders of the SBPO’s successor nonprofit — the Bay Park Conservancy. Their goal, as outlined on the day’s meeting agenda, was to win City Commission approval of the “term sheet,” or essential elements, of the contract that will dictate responsibilities of the city and the Conservancy in regard to The Bay. A.G. Lafley, former chair and CEO of Proctor and Gamble, greeted the commission at the outset of the discussion, noting that he is the startup CEO for the Bay Park Conservancy (BPC), just as he chaired the SBPO. With him were Jennifer Compton, a Sarasota attorney, who serves as the BPC secretary, and Bill Waddill, managing director of the BPC. Assistant City Manger John Lege reminded the commissioners that on Oct. 1, 2018, they approved the preliminary agreement outlining the transition of the SBPO to the BPC. Lafley then reminded the commissioners that the Conservancy “is not a new form of organization.” The first one in the United States, he pointed out, was created in the 1930s to oversee New York City’s Central Park. Lafley added that the BPC board already had rehired Sasaki, the Boston-area project team that worked on The Bay Master Plan, so the firm could undertake some preliminary work and then be poised to delve into the details of Phase I of The Bay as soon as the City Commission approved the contract with the Conservancy. The first commissioner to pose questions of the BPC representatives was Shelli Freeland Eddie. In reviewing the term sheet, she explained, she did not find specific language regarding direction the commissioners provided last summer to the SBPO. For example, she said, she wanted to make certain The Bay would be accessible to the general public and that its amenities would be affordable. She also referenced 2018 discussions regarding the commission’s intent that any Bay-related initiatives reflect diversity and inclusion — “that whole theme, from the time we dig up dirt to the time that people are working there,” as Freeland Eddie described it on Feb. 4. Further, she questioned Assistant City Manager Lege about term sheet language regarding the purchase of goods and services. She then asked about language in the term sheet giving the Conservancy the right to set fees for users of amenities at The Bay. Freeland Eddie also referenced a statement in the term sheet calling for “one community meeting.” She added, “I know that can’t be true.” As the BPC works on each phase of the master plan, she told Lafley, Waddill and Compton, “you [need to] come back [to the commission] at regular and appropriate intervals.” Regular communication with members of the public, including neighborhood associations, will be necessary, too, Freeland Eddie added. After Vice Mayor Ahearn-Koch voiced her concerns about the vagueness of the term sheet, Lafley responded, “It’s not like we just showed up. I think we’ve had 10, 11, 12 meetings since September” with senior city staff members, working out the language. He emphasized that the document “is not a contract.” It is just a framework for the final agreement between the city and the Conservancy, he pointed out. Still, Lafley told Ahearn-Koch that he, Waddill and Compton would be happy to meet with her and any of the other commissioners about their specific concerns. The city commissioners, Ahearn-Koch emphasized “are the ones that are protecting this public land for the public,” so it is necessary to build trust between the commissioners and the Conservancy’s board. “We would love to have the feedback that you have specifically,” Compton told the commissioners. “This is a document that could live for 45-plus years,” she said of the final agreement, “so it is not going to [plan for] every eventuality,” but it will provide the guidelines for dealing with issues that will arise. As the discussion continued, Commissioner Hagen Brody voiced worry about the fact that the interim agreement between the city and the BPC was set to end on March 31. He asked Lafley if Lafley were comfortable with the prospect of delaying a vote on the term sheet. “March 31 is not an artificial timeline,” Lafley replied, noting the nonprofit’s limited remaining funds. Finally, as the commissioners focused on upcoming commission dates, Deputy City Manager Marlon Brown continued to remind them of the applicable deadlines for agenda material to be provided to them and to the public. Compton also expressed concern about completing the materials in a timely fashion, as she would need to work on them with City Attorney Robert Fournier. Mayor Liz Alpert suggested that the Conservancy provide the commission with both a revised term sheet and a draft of the final agreement “that we can tweak” during the board’s regular meeting on March 18. The materials would have to be delivered to the city for public advertisement no later than Monday, March 4, Brown pointed out. Then, at Brown’s suggestion, Ahearn-Koch made a motion that included not only the direction for the term sheet and draft final agreement to be discussed as part of the March 18 agenda, but also for the interim agreement with the Conservancy to be extended to April 1, when the final vote on the contract would be taken. Ahearn-Koch’s motion further called for the Conservancy board to conduct public outreach as it worked to complete the documents. Commissioner Willie Shaw seconded the motion, and it passed 5-0.